Visual Studio Code(VS Code) is one of the newest text editors to join the group of new powerful source code editors like Atom, Sublime Text and brackets. All of which have become extremely popular in recent years. Visual Studio Code is currently my favorite text editor. It is cross-platform, lightweight, extensible and powerful. So of course I want to use it when working with AnyScript. 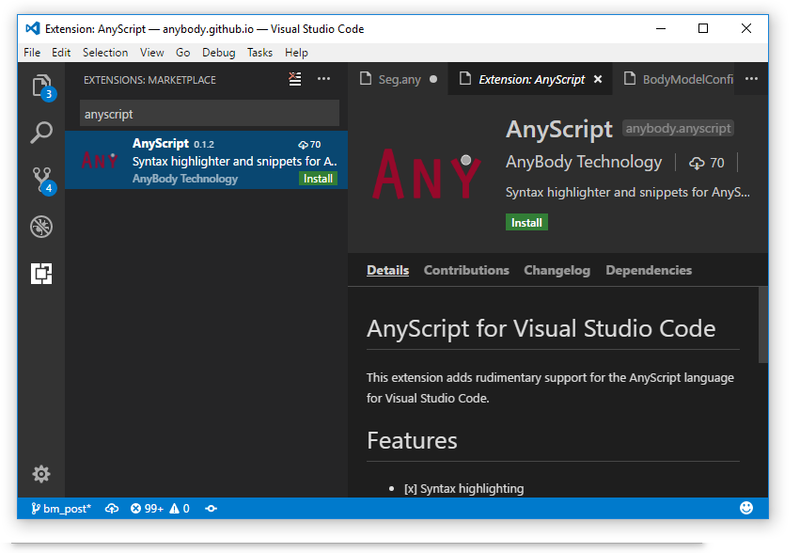 In this post I will show a new AnyScript extension for VSCode, that does syntax highlighting, code folding, and snippets. This is the second post in our series on using external editors for AnyScript. In the first post) I showed a handy extension for Notepad++, so if you use Notepad++ check that post. Visual Studio Code or VS Code is a source code editor developed by Microsoft for both Windows, Linux and MacOS. It is free, open source and includes a lot of advanced features for working with source code. It is also very customizable so users can change themes, keyboard shortcuts and much more. Screenshot from Visual Studio Code, with AnyScript syntax highlighting. 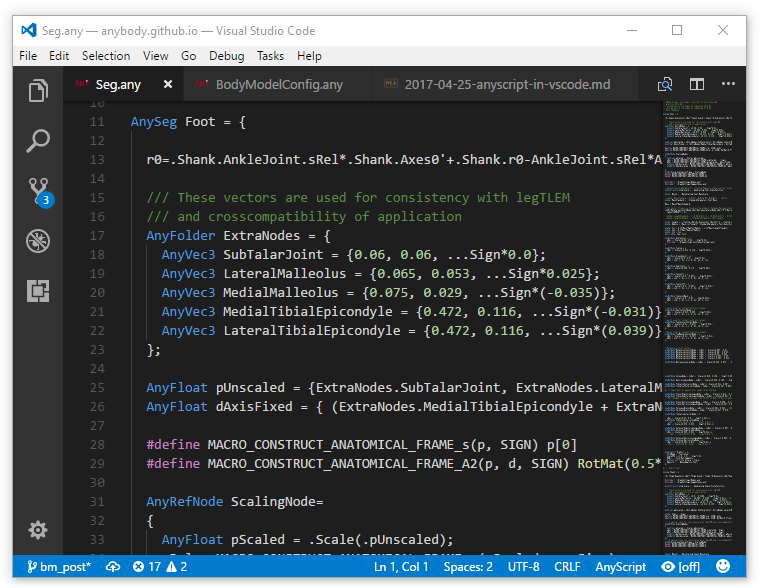 VS code looks a little different from traditional Windows programs, but it is easy enough to use. The simple looks deceives. VS Code has all the same features as for example Notepad++, and if you miss a certain feature VS Code has a good extension system. So the chances are that there is a user contributed extension to help your specific need. In the screen shoot above shows a file with AnyScript syntax highlighting. Highlighting in AnyScript files works as soon as the AnyScript extension is installed. It is easy to install. Just click the extension icon at the bottom of left sidebar and search for AnyScript. Then click install. Once the extension is installed the all AnyScript files will have highlighting. THe plugin also gives you code folding, which allows you to collapse classes and folders. A feature which is really handy when working on large files. VS hCode supports code snippets which are templates that makes it easier to write repeating code patterns. This part isn’t fully supported by the extension yet. But I have added few snippets for the following classes and functions: AnyDrawRefFrame, AnyRefNode, RotMat, AnyFunConst, AnyFolder, AnyKinMeasureOrg, AnyKinRotational. The snippet inserter is activated by pressing ctrl-shift-P and then writing insert snippet. Note: you need to be in a AnyScript file to get the AnyScript snippets. Snippets can also be inserted using the tab completer. So if you start to type the name of the class e.g. AnyDrawRe and press tab the snippet is inserted. The snippets are just meant as a test, but hopefully we can have snippets for all the AnyScript classes in the future. Here is an link to page where the extension live: https://github.com/AnyBody/vscode-anyscript. Any improvements and help is most appreciated.